5 Piece Dining Table Set 4 Chair Glass Metal Kitchen Room Breakfast NEW. Dining table is quite essential for households! If you want to get some special style on dining table design, this Simple Assembled Tempered Glass & Iron Dining Table will never let you down! 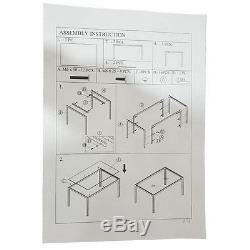 In this offer, you will get the required parts for assembling a complete dining table. 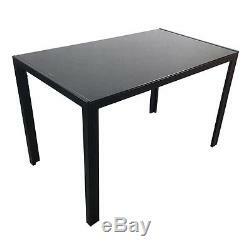 Made with high-grade tempered glass and iron materials, together with given screws, the table will be durable to use. Dining chair is quite essential for households! If you want to get some special style on dining chair design, this 4pcs Elegant Assembled Stripping Texture High Backrest Dining Chairs will never let you down! 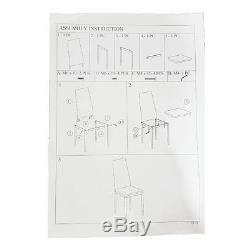 In this offer, you will get the required parts for assembling a complete dining chair. 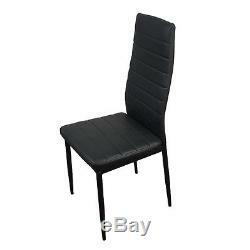 Made with high-grade PVC, iron and sponge, the chair will be durable and comfortable to use. Its high backrest could provide support when you are sitting on. Concise but stylish, this dining set is really worth having! High-class materials, meticulous design and workmanship. With great strength and durability. It is easy to install. Simple but elegant dining table for household. New and high quality 2. High-class materials, meticulous design and workmanship 3. With great strength and durability 4. 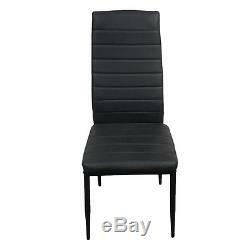 High backrest for offering excellent comfort and support 5. It is easy to install 6. Simple but elegant dining chair for household. Material: Tempered Glass & Iron. 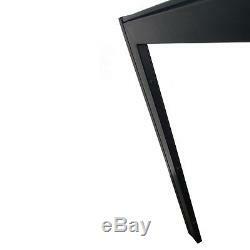 Table Dimensions: (47.24 x 27.56 x 29.53)(L x W x H). Tempered Glass Thickness: 0.32. Load-bearing: 150kg / 330 lbs. Weight: 30.2kg / 66.58 lbs. Cushion Dimensions: (15.74 x 18.5) (L x W) 2. 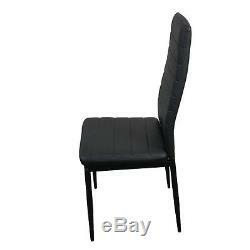 Chair Dimensions: (15.74 x 18.5 x 38.58) (L x W x H) 3. Material:PU Leather & Iron & Sponge 6. 1 x Tempered Glass(8MM). 12 x Screw(M6 5cm). 4 x Screw(M6 2.5cm). 8 x Screw(M6 4cm). 16 x Screw(M6 1.5cm). 360°Adjustable foldable laptop Notebook Desk Table Stand. Wood Breakfast Bed Tray Lap Desk Serving Table. Bedroom Bedside Furniture Nightstand Set. Bathroom 24 Vanity Vessel Sink Basin Cabinet. 50 Pair 10 Tier Shoe Tower Rack Organizer. 20 Slot Watch Box Leather Display Case Organizer. International Buyers - Please Note: a. If you need return, please contact our customer service representative, let us know the detailed problem and send us some pictures for confirmation. If you are dissatisfied for any reason, please do not be quick to leave negative/neutral feedback. We work hard to make sure EVERY CUSTOMER 100% SATISFIED and resolve any problem for you. Work Time: Monday to Saturday. If you are dissatisfied for any reason, please donot be quick to leave negative/neutral feedback. Work Time:Monday to Saturday. The item "5 Piece Dining Table Set 4 Chair Glass Metal Kitchen Room Breakfast NEW" is in sale since Wednesday, June 21, 2017. This item is in the category "Home & Garden\Furniture\Dining Sets". The seller is "yallstore" and is located in Multiple Locations.